According to cognitive neuroscience there are at least two ways of knowing yourself. One through integrating multimodal signals into an egocentric reference frame and assigning the first person perspective. Another through the cognitive ability to disengage from the embodied first person perspective and adopt another person’s perspective on your experience. These research traditions have progressed with relative independence in the field. For example, different paradigms examine feelings of body ownership and agency from a first person perspective (e.g. the Rubber Hand Illusion) versus third person perspective, self-recognition in mirrors. Inspired by psychoanalytic insights on development, I present a set of behavioural and neuroscientific studies with healthy individuals, neurological patients with right-hemisphere damage and patients with anorexia nervosa, putting forward the idea that first and third-person perspectives on the self dissociate and proximal, embodied experiences of affective congruency may act as the ‘emotional glue’ between such first and third-person perspectives on one’s own self-consciousness. Without such unification, self-consciousness is either dominated by egocentric (narcissistic), interoceptive priors (as in anosognosia for hemiplegia), or third-person (super-ego) judgements lacking in affective anchoring to the body (as in anorexia nervosa). By contrast, the progressive integration of these perspectives contributes not only in a flexible, unified experience of the self in adulthood, but our ability to understand other minds and empathise with their embodied and mental experience, even though ours may be different. Katerina Fotopoulou, PhD, studied cognitive neuropsychology and theoretical psychoanalysis before completing her PhD in cognitive neuroscience at the University of Durham, UK and her clinical training as a Counselling Psychologist (DCounPsych) several years later. She is currently an Associate Professor (Reader) at the Clinical, Educational and Health Psychology Department, University College London. There she researches how embodied experiences are interpersonally ‘mentalised’ and perceived to form the basis of our selves. 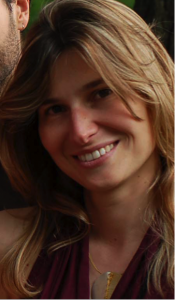 Katerina is the Founder of the International Association for the Study of Affective Touch (IASAT) and the London Psychodynamic Neuroscience Group on: ‘Psychodynamic Neuroscience and Neuropsychology’. She has published widely in psychology and neuroscience journals and is the editor of the volume: Fotopoulou, A. Conway, M.A. Pfaff, D. From the Couch to the Lab: Trends in Psychodynamic Neuroscience. Oxford University Press, 2012. In 2016, Katerina was awarded the Junior Investigator Award of the International Neuropsychological Society.